In my little corner of South Woodford in the borough of Redbridge you can always tell when there’s an election coming up. The Tories start taking an interest in Liberal Democrat-held Church End ward. This time round they’ve begun campaigning a little earlier, with three candidates making more of an impression than their predecessors. Perhaps they scent weakness with the announcement that a long-serving LibDem councillor is standing down while another has been cast adrift over poor attendance. So there have been more editions of In Touch, the Tory newsletter to rival the LibDems’ Focus. There was also a residents’ survey that asked a couple of soft questions about local affairs: what did you like or dislike about living in Redbridge? Then it got down to the nitty-gritty with a selection of touchstone Tory national issues: getting the economy moving (scrap the deflationary policies sooner was my retort); reforming welfare so that working always pays more than a life on benefits (a nod to Iain Duncan Smith, Chingford and Woodford Green MP and architect of the bedroom tax, possible the worst policy since poll tax). doctors and nurses and cleaners and … you get the picture). Oh, and another one for the Ukip tendency, a referendum on EU membership. I wonder how many local residents work in the City for banks that will up sticks to Frankfurt the moment we quit Europe? Step forward local Tory candidate Tom McLaren of Commerzbank’s ABS Management team. I think that’s something to do with packaging up debt and flogging it off. Really useful banking. Other leaflets have sought to take credit for the campaign to strip Funkymojoes, the pub that thinks it’s a West End nightclub, of its late licence over the misery caused to elderly residents of neighbouring flats. They’ve also tried to frighten local businesses into thinking that Church End is a hotbed of criminal activity. A bit rich, coming from the party that’s cut police numbers and closed police stations across the capital. There was even a poor quality YouTube video of some drunken shouting that appeared to be an issue for Redbridge housing department. That would be Tory-controlled Redbridge housing department. It all seems to be directed at obtaining a controlled drinking zone, as if the place was overrun with drunks. One leaflet got very excited about 48 car crimes in three months that targeted £1m worth of cars. That would be at an average of £20,833 each, which seems a bit unlikely. I suspect a rogue statistic there. Another seems to think we should cheer the Tories for not implementing further cuts at Redbridge Drama Centre, again after local uproar at a Conservative proposal. Local economic policy seems to consist of 30 minutes of free parking in the George Lane shopping street, to which the council has been dragged kicking and screaming after Wanstead businesses demanded some respite from the parking attendants. But it will make for yet another photo opportunity with IDS, perhaps orchestrated by Joel Herga, the young PR man who has worked for several Tory MPs and is another of the candidates. I’m sure local politics will be good for his CV until a safe seat comes along. The third candidate, Emma Best, appears to have little troubled the search engines. Quite recently there’s been a letter to individual voters. I don’t think everyone got one. But I’ve seen a copy. It certainly takes a spin doctor to suggest that the LibDems have ‘parachuted’ in replacement candidates. Richard Hoskins’ retirement after 24 years of service is also hardly evidence of the local party ‘imploding’, as the letter suggests. The latest Focus reveals that the LibDems are putting up sitting councillor Hugh Cleaver, who was elected in 1990; a 35-year resident of the ward and former parliamentary candidate in Geoff Seeff; and a 25-year resident in Deborah Prince, legal director of the British Heart Foundation. And it is stretching credulity to suggest that the temporary swimming pool in neighbouring Wanstead, installed as part of Boris Johnson’s Make a Splash programme, justifies the claim that ‘the swimming pool many of you asked for is now being built’. Or is that referring to plans for a permanent pool in the south of the borough for which no site has yet been agreed, according to local newspaper reports? It may be the next set of elections before we can take a dip there. The local elections are on May 22. Please vote. PS. While the LibDems have parted company with Nicola Sinclair, they have at least not had to apologise for claiming she failed to attend a licensing hearing about Funkymojoes. That has been left to the Tories, apparently ignorant that in Redbridge councillors do not sit on licensing hearings for their own ward. PPS The latest, very glossy, Tory leaflet admits they have had little success with the farmers’ market for George Lane after eight months’ effort. This would of course compete with the excellent greengroceries at Fiori’s and the International Supermarket as well as the national chains M&S, Sainsbury and Waitrose. I am not surprised that Sainsbury’s are refusing to back this endeavour. I am just astonished that the Tories, of all people, appear surprised by this expression of capitalism. Perhaps they’ll learn to hang on to more municipally-owned land in future. I must acknowledge that we are told more about Emma Best in the latest leaflet. She went to school in Wanstead and is working for Crossrail while studying for a degree. Don’t know if she lives in the ward. This entry was posted in Politics and tagged Church End, Conservatives, Liberal Democrats, Local elections, Local government, London, South Woodford on April 3, 2014 by paulnettleton. So the latest economic statistics show that a broadly based recovery is taking hold in the UK. Phooey! Even with the best gloss on the percentage growth figures, total GDP remains below that before the crash of 2008. And the Bank of England governor, Mark Carney, has been casting about for a form of words to explain why interest rates cannot rise even when unemployment falls below 7%. Of course, the latest jobless statistics were published before a couple of high street banks announced a further cull of staff. You only have to look at continuing falls in house prices in regions such as the North-east of England to know that recovery is still to arrive outside London and the commuter belt. But that’s all right. Transport for London has been told to expect treble the predicted number of commuters to arrive daily at stations such as Farringdon when Crossrail opens. That means more house price rises in the South, boosted by the Help to Buy scheme that has already delivered more Stamp Duty to Treasury coffers. Yes, with one hand George Osborne gives, with the other he takes away. Meanwhile, the rest of the nation suffers a brain drain of the brightest and best. And small- and medium-sized companies still cannot borrow the money they need to expand, which just exacerbates the problem. At least the government has a policy on that issue. What goes unmentioned in ministerial comments about the economy is any policy to deal with the drag on recovery, and the personal tragedies, represented by household debt of £1.4 trillion. There are nine million people living with serious debt, according to the government’s Money Advice Service. It’s not as if ministers don’t know the scale of the problem. I imagine Iain Duncan-Smith still reads the reports published by his Centre for Social Justice. The staggering figure above came from Maxed Out, a report written by a Labour former minister, Chris Pond, which put the average household debt at £54,141 compared with £29,000 a decade ago. That figure might well have increased after the Christmas spending enabled by payday loans. During Debt Awareness Week this month, the StepChange debt charity reported that it was approached by new clients owing £230 million. In the absence of a policy, the top result on Google when you search for ‘UK government policy personal debt’ is headlined Options for paying off your debts. We all paid to bail-out the banks and endured the so-called Great Recession from which the wealthy appear to be recovering considerably faster than the rest of us, helped along by a cut in the top rate of income tax. But there’s no bail-out for families trapped by debt that they were encouraged to accumulate, nay had thrust upon them by the banks and credit card companies during the last credit-propelled ‘recovery’. So what’s the government’s answer? A rise in the minimum wage to restore its lost value. Peanuts compared with the national wealth squandered on saving the RBS group etc etc. Oh, and more cuts to benefits to drive people into Mac jobs on zero hours contracts. But the bankers must have their bonuses, or the service economy of the capital might suffer. Heaven knows what hardship City traders might suffer if all the Polish plumbers and Bulgarian baristas went home. What won’t happen soon is any meaningful reduction in household debt, and particularly the consumer debt that has trebled since 1993 to reach £158 billion. That’s bad news for the high street and bad news for manufacturers looking for domestic sales growth. It will also mean more family breakdown and more personal insolvencies. Perhaps it’s time for a national policy on debt forgiveness for families. I don’t doubt that jobless statistics will shortly record a reduction to below 7%. But how many of the people losing their jobs in the months ahead will be joining those scraping a living in the growing army of the self-employed? Or eking out an existence on a pension taken too early, because some employers just don’t take on older workers. And what’s ahead for those in work? Not much in the way of pay rises so far, with increases in wages running at 0.9% while inflation under the Consumer Prices Index is at 2.1%. I don’t know whose cost of living that index records, but it doesn’t match the increases in my energy, food or travel bills. Still, the dwindling band of full-time staff can make up some of the shortfall by working longer hours, filling the gaps in the workforce by those let go, under contracts of employment that invite you to ‘be helpful’ with catch-all job descriptions. Oh, and don’t forget to clear the kitchen sink before you go home. This entry was posted in Personal debt and tagged credit, Credit cards, debt, Economy, government policy, income, interest rates, jobless, London, Maxed Out, money, politics on January 29, 2014 by paulnettleton. Which way to go in Epping Forest? The closure for three weeks of Cross Roads at High Beach in Epping Forest, to permit the installation of cattle grids that was strenuously opposed by horse riders, has been baffling motorists trying to reach the A104 Epping New Road and head south towards London. Running parallel with the A104 is Fairmead Road, which appears on Google Maps, for example, to join the main road a kilometre or so to the south. Cars do inch along this rutted route, now given over to forest users, to reach a couple of car parks. Unfortunately for motorists seeking a way out of the woods, the southern exit is gated and closed to all except walkers, riders and cyclists. Doubtless motorcyclists might squeeze past the single traffic cone, that was today sporting a very temporary City of London Corporation sign stating there is no way through, and over the hump of earth that blocks the old road just before the gate. Many a car driver or a white van man, though, will be faced with a lengthy diversion north to the A121 and on to Epping New Road at Wake Arms Roundabout (where for baffled tourists there is no longer a pub of that name, but a steak restaurant). Some have tried their luck, and risked their suspension, by driving down Fairmead Road at speeds that raise choking clouds of dust, before turning round in frustration and heading back to the official diversion. Update, 14 June: I checked and there’s now a freestanding metal sign to indicate that Fairmead Road is a dead end. The No Through Road sign under the trees is still leaning at a crazy angle. Oh, and is that asbestos corrugated roofing material that’s been flytipped at the end of the road? It’s been taped off, so the authorities must be aware. This entry was posted in Just Fancy That and tagged Epping Forest, Essex, Flytipping, Local government, London, Maps, Roadworks on June 6, 2013 by paulnettleton. In a hall at Battersea Arts Centre, just round the corner from Clapham Junction, the European Union’s latest recruit was showing off its wares. While Europe continues to divide the Conservative party and define Ukip by what it opposes, here were businesses keen to make deals in the single market. Croatia was once part of the Austro-Hungarian empire and later part of Marshall Tito’s communist federation of Yugoslavia. It declared independence in 1991 and cleared occupying Serb armies by 1995. Now a member of Nato, Croatia signed the EU treaty of accession in 2011 and will become a member on 1 July. Stalls at a trade fair organised by the British Croation Business Club were festooned with products that will be familiar to tourists who venture further south to Greece or Turkey – many the products of the olive tree. Olive oil, olive oil soap infused with medicinal herbs, olive tapenade. Neb Chupin of Hermes International was promoting the Taste Dalmatia range of conserves. There were bitesize samples of tapenade, sour cherry or organic fig spread, the latter an explosion of flavour when married with a little cheese. A British couple, Tim and Paula Batson-Jones, were explaining how they are involved at every stage of producing their 100% extra virgin olive oil. They help harvest the native Oblica olives from their own groves on Brač, near Split, oversee its pressing and bottling, then drive back to Bristol and sell mail order through their website, croatianimports.co.uk. Sounds small scale. Yes, but they recently saw off 200 rivals to win a gold medal for the quality of their oil. That sounds like a recipe for success. Tim sounds a little concerned for Croatia’s future in the EU. It’s perfect as it is, he reckons. Small, you feel, is beautiful for many of the stallholders. It’s explained to me that while much business is carried out in euros, the country will be retaining its own currency, the kuna. It means marten in Croatian and is based on the medieval use of pelts as units of trading value. There are 100 lipa (linden or lime trees) to the kuna. Another British enthusiast for the country, Sarah Driver of Walk Croatia, can hardly wait to accompany the first group of the summer to go wine tasting along the Pelješac peninsula, north of Dubrovnik. It’s not just the wine or the walking, but the oysters of Mali Ston Bay, the only successful breeding ground of the European flat oyster, Ostrea edulis. 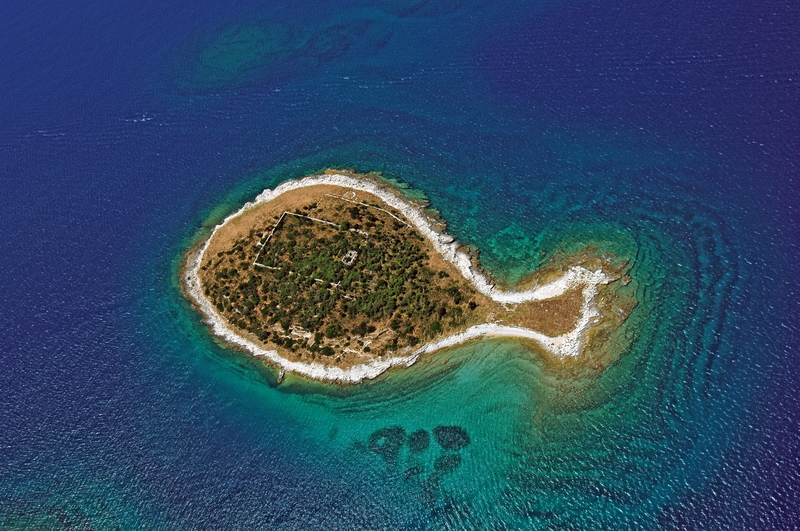 The company offers island-hopping walking and sailing holidays in the Dubrovnik region. You don’t have to go far to find historical sites, islands with empty beaches or rugged mountain scenery in a country where the climate is a mix of the Mediterranean and continental. There were bigger companies represented, among them Croatia Airlines, patrt of the Star Alliance, and Valamar Hotels & Resorts with 39 properties along the Adriatic coast. They represent the modern face of Croatian corporate business, with glossy bilingual inflight magazines and brochures. There was tradition too, in the cheeses of Paska Sirana, a company from the island of Pag. Layers of sea salt swept in by the winter winds cover the grasses and herbs of this rocky island. Paški Sir, the hard cheese made from the milk of sheep that graze this land, has protected geographical origin and a unique taste. Eat as an appetiser if young, and a dessert if old. But I was most taken by the enthusiasm of Hrvoje Subat, a young committee member of the British Croatian Business Club who lives in London and energetically promotes his home country as a place to invest in property; of wine importer Mislav Kapetanovic, shepherding tastings of fresh, green appley Grasevina whites, a modern take on native grapes from the Danube valley bottled by vintner Vina Belje, alongside more traditional reds including Cabernet Sauvignon and Merlot. It made for a heartening contrast to the blinkered British cynicism about Europe and all its works. And it made me add Croatia to my must-see list of countries. This entry was posted in Europe and tagged business, Croatia, Drink, European Union, Food, London, Tourism on May 28, 2013 by paulnettleton. My favourite way in to the River Lee Country Park is to drive up the Crooked Mile from Waltham Abbey and turn left into Fishers Green Lane before parking up and taking a walk or a bicycle ride around the Seventy Acres Lake. Striking out south brings you to the Royal Gunpowder Mills museum, north to more gravel pits and Nazeing Marsh. It all sounds a bit Wind in the Willows and there are plenty of people messing around in boats – whether it be on the Lee Navigation, where there is a steady traffic of pleasure seekers in narrow boats along the canalised waterway, or at Holyfield Lake. Here the members of Fishers Green sailing club must steer clear of the weirs. The park draws walkers and anglers and birdwatchers and photographers in all weathers, to watch the comings and goings of the wildfowl and the march of the seasons. After rain, the Horsemill Stream and the Cornmill Stream and the Small River Lea (the alternative spelling), all part of the flood relief system, can run swift and powerfully. Even when the waters appear placid there’s plenty going on under the surface. Invasive virile crayfish have been found in the river, where in the 80s the signal crayfish wiped out the native white clawed crayfish. There are also terrapins, bought as pets during the Teenage Mutant Ninja Turtles fad and released into wild after their owners tired of their growing size and appetites. Then there are the human battles, for the future of salad growers in and around the regional park. And, with local authority budgets cut, there is political pressure on the authority to become self-financing. Their glasshouses are, say the growers, too small to secure the long-term viability of the valley’s traditional market gardening. They say they are being squeezed between the demands of supermarket buyers for year-round supply and cheaper produce, and the park’s opposition to expansion of the area under glass. The park is not a planning authority but has to be consulted by Epping Forest district council, where most of the growers are located. It has no remit to support horticulture, rather seeing production as a secondary function (pdf). The river has a long history of quarrying and industry which has shaped the valley’s post-industrial landscape alongside farming and the glasshouses which have been in operation for more than a century. Today, to the east of Cheshunt, there’s a mainline railway running within earshot of the river and electricity pylons march along the valley floor and across the former gravel pits to a substation. National Grid wants to upgrade the overhead lines to carry 400kV instead of the current 275kV. Consent is being sought for the work, with a decision expected by 2014. The park’s boundaries skirt the extensive industrial estate on the west bank through Brimsdown, and the vast Sainsbury’s distribution centre by the M25 at Waltham Abbey. The jobs they provide are essential. 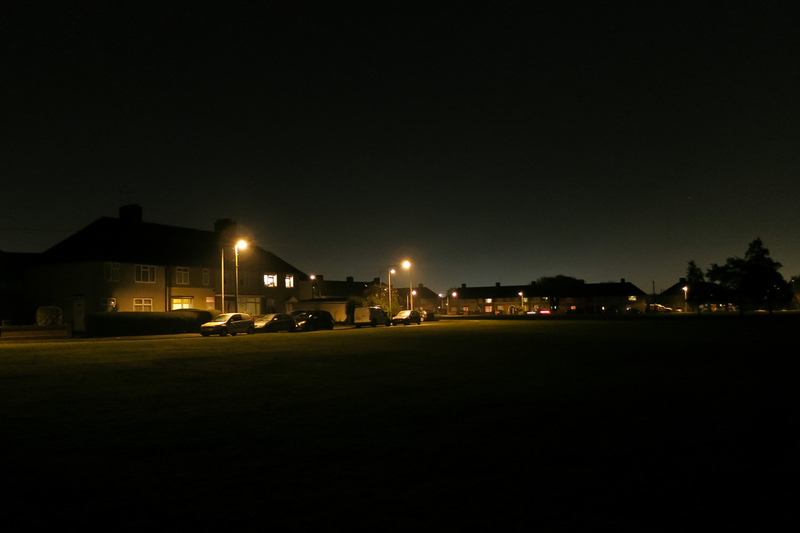 There are pockets of deprivation in the town and it is not so far from Tottenham, which is seeking its own economic recovery after the London riots. The authority wants the legacy of the London 2012 Olympic Games, with the momentum they generated for regeneration of brownfield sites and the watercourses around Stratford, to be a world class park for Londoners and a tourist draw in the green belt of Essex and Hertfordshire. Hectare upon hectare of glasshouses, especially built taller and perhaps making more use of artificial lighting to extend the growing season and range of crops, are not seen as an attractive landscape feature. Nor are heavy lorries welcomed to narrow local roads. A report by consultants to Epping Forest council (pdf) in 2012 set out in considerable detail the challenges for the growers and the dilemma for the councillors, who also have to contend with the pressures on the forest itself as another “green lung” for London. Among the report’s conclusions were proposals to increase the area designated for protected cropping in glasshouses to head off increasing competition. This comes from abroad and also from Thanet Earth, the development of vast glasshouses in Kent where Combined Heat and Power technology means waste heat is used to warm the crops while electricity is produced for the grid. When the shelves of the city’s supermarkets boast of locally-sourced or “East Anglian” produce, they are likely to mean cucumbers grown by members of the Lea Valley Growers Association alongside tomatoes and peppers. For the past two years they even held a Great British Cucumber Festival to celebrate the fact that the valley produces 75% of all UK cucumbers – about 1.2 million a week. There’s no event this year but “Cue Fest” is due to return in 2014. The Epping Forest report painted a picture of an ageing generation of farmers running businesses on a knife edge of viability, needing to invest to thrive and grow, but hemmed in by physical and planning constraints. The need is for largely level sites, suitable for glasshouses which are regarded as temporary structures, and sufficient energy. On national salad day last month, David Heath, Minister of State at the Department for Environment, Food and Rural Affairs, was asked in the Commons by Robert Halfon, the Conservative MP for Harlow, if he was aware of the concentration of salad growers in his consituency around the villages of Roydon and Nazeing. The views into the LeeValley from High Beach in Epping Forest are striking. A study of Google Earth or Maps gives you an idea of the extensive area under glass, but its hardly on the scale of the Netherlands. My own view is that there is room for more glasshouses without throwing stones at the park’s leisure remit. This entry was posted in Politics and tagged Food, Geography, Glasshouses, Horticulture, Landscape, Lee Valley, Leisure, Local government, London, Planning, Tourism on April 6, 2013 by paulnettleton. There can hardly be two places in England as different as Coniston in the Lake District and Stratford in east London. One is a village nestling beneath the Old Man peak, squeezed between a ring of Cumbrian fells and Coniston Water; the other has been an industrial suburb of the capital, and is now entering a post-industrial future after hosting the London 2012 Olympics on a brownfield site by the River Lea. Coniston has lost its copper mines, though there’s still a working slate quarry, while Stratford no longer has a railway works though it remains an important hub. Yet there is a link, with a nod to that industrial heritage, through art, crafts and architecture. Walk north along Yewdale Road from the bridge across Church Beck and on the left is the Coniston Institute, which was opened in 1878 after energetic fundraising by John Ruskin, who lived across the lake at Brantwood. 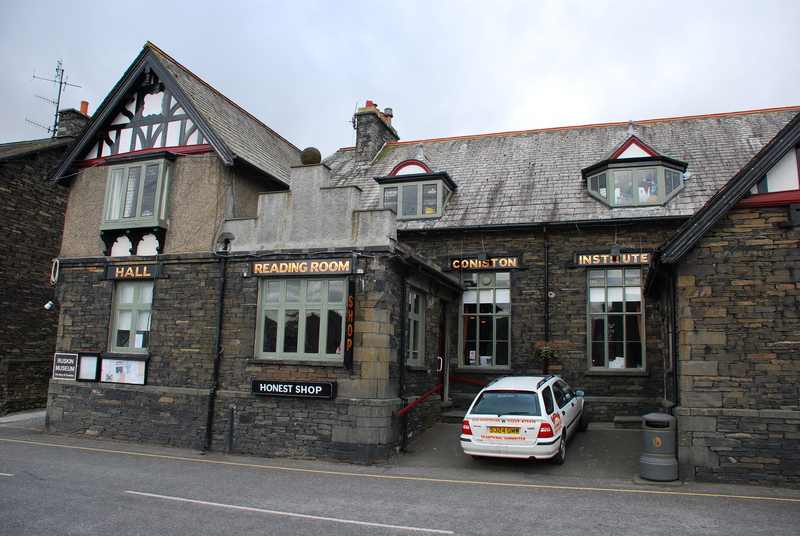 It was a new home for the lifelong learning promoted from its foundation in 1852 by the Coniston Mechanics Institute and Literary Society. In extended premises at the rear of the institute is a museum devoted to Ruskin with exhibits also relating to the copper mines and slate, local geology, lace, farming and Donald Campbell. The museum’s website has some great Coniston links to explore. There’s a public library and function rooms for hire. 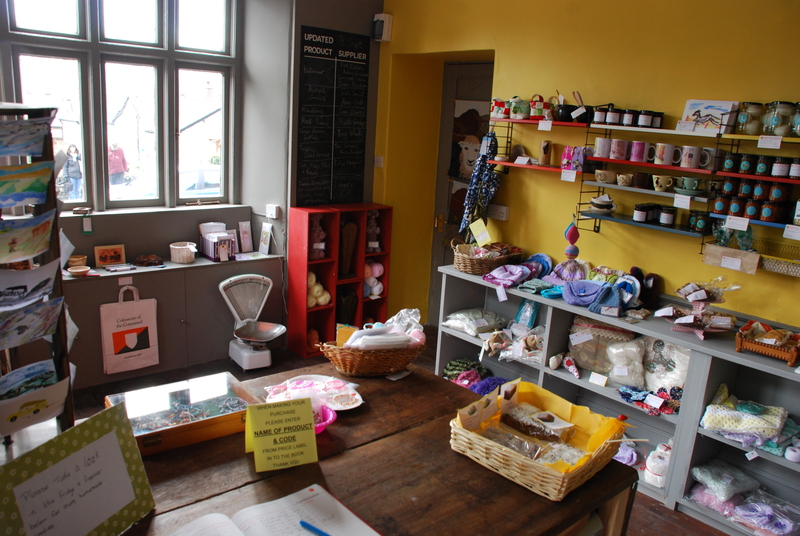 And since 2012 there has also been the Honest Shop, stocking local produce and craft. It’s this which provides the link to Stratford. You can’t go far in this part of Cumbria without coming across the activities and influence of Grizedale Arts, which “emphasises the use value of art, and promotes the functions of art and artists in practical and effective roles, as a central tenet of wider culture and society”. Grizedale Arts has been working with residents on the renovation and development of the institute. Archtitect Liam Gillick has designed a new self-service library and An Endless Supply, a design studio and run by Harry Blackett and Robin Kirkham, was commissioned to design the interior of the shop “a defibrillator-in-disguise for the UK economy”. There’s a touch of these austere times about the interior. As their website explains, the shop is unstaffed and customers pay for what they take in the honesty box (Grizedale Arts confess that: “Typically for a haven of visitor experience tranquility, the money tin was stolen on day two.”) Profits go to the sellers and are ploughed back into the upkeep of Coniston Institute. The shop was featured on the BBC’s Countryfile programme. John Craven bought an apricot loaf. We plumped for eccles cakes and a carrot cake with orange frosting. About 280 miles away (more if you take a scenic route across the Pennines) in London, there’s not yet so much choice at the Honesty Stall situated at the gates to Abbey Gardens in Bakers Row, Stratford, a step away from Abbey Road station on the Docklands Light Railway, where a sign helpfully redirects tourists and Beatles fans looking for a certain zebra crossing to the other Abbey Road in St John’s Wood. It’s only a stone’s throw from Stratford and West Ham on the London Underground and national rail. There are railway cottages across the road, and the remains of others within the grounds of this open access community garden (visitors welcome from dawn to dusk when the gates are open). Long before the coming of the railway and the nearby India rubber works and other heavy industry, there had been a 12th century Cistercian abbey on the site, complete with kitchen garden and a gatehouse here. The Friends of Abbey Gardens has been working to reverse years of neglect since 2006. It initiated work on the garden, which has been designed by artists Nina Pope and Karen Guthrie of Somewhere, a multi-disciplinary, non-profit creative company. The site had to be cleared of contaminated soil before planting for food could begin. Arsenic, lead and benzoapyrene were among the chemicals found in a survey. 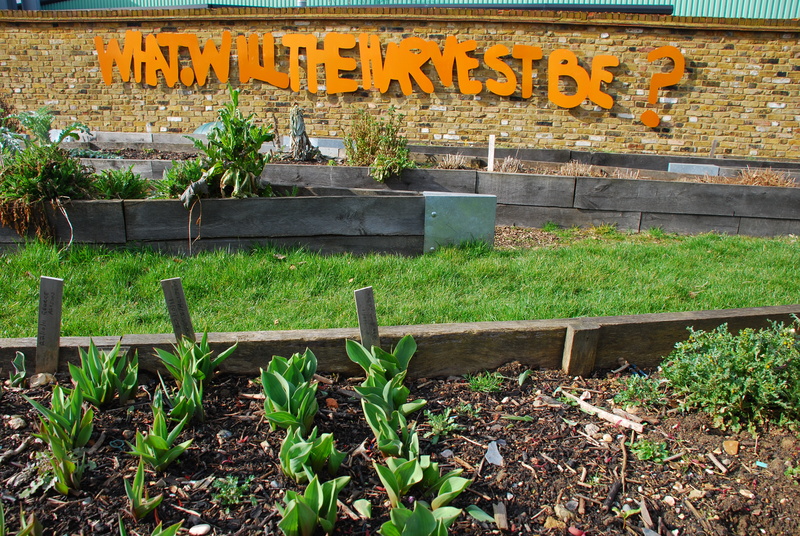 Now there’s a sign on a brick wall that asks What will the harvest be? The answer is whatever the regular gardeners agree and there are thousands of wonderful photos on Flickr capturing the activity at the gardens. And some of what’s grown is also sold on the mobile Honesty Stall designed for Abbey Gardens by Andreas Lang. One afternoon this week, with a touch of spring finally in the air, preparation and planting in the raised beds and greenhouse with guidance from gardening club leader Hamish Liddle came to a halt while a dunnock sang his heart out from an ivy branch shooting above the wall, attracting a second bird – a possible partner or rival was unclear. Lang is a key link between Coniston and Stratford through the International Village Shop, a network of trading places for locally rooted goods. A founder of Public Works, he trained at Central St Martins school of art and at the Architectural Association, London. As with Grizedale Arts, Public Works “projects address the question how the public realm is shaped by its various users”. This spring and summer, both projects are well worth a visit. Don’t forget to put your money in the honesty box. This entry was posted in Art and tagged Architecture, Cumbria, Design, Heritage, History, Lake District, London, Stratford, Tourism on March 20, 2013 by paulnettleton. The flight of white Britons from London has been generating considerable heat for moderators of online chat to hose down on the nation’s media websites. There’s been a lot of statistical analysis of this population movement, as ever in matters of immigration and race adding up to the right or wrong answer according to the views of the writer or reader. There’s a lot of anger out in chatroomland, much of it directed at Muslims accused of failing to integrate into mainstream British society. It’s also brought a new comparison to replace the notional number of football pitches, countries the size of Wales or planets the size of Earth. We now have to imagine the equivalent population of a city the size of Glasgow marching out of the capital between 2001 and 2011. In my own London borough, Redbridge, there has been a 29.8% decrease in the white British population, according to census data. That figure masks sizeable variations within the borough, measured by council ward. In my local area, South Woodford, the figure is considerably smaller, according to the ONS map reproduced in a report by the BBC’s Mark Easton. I’d have said the biggest demographic change locally is in the number of east European voices heard in the street and at the tube station, and the biggest visible change in the diversity of the cafes, restaurants and shops. Easton has considered in some detail the population history of Barking and Dagenham, and the rise and fall of of car manufacturing by Ford in the borough, to conclude that the story is much more positive than bald headlines about the white British having become a 45% minority of the city’s population might suggest. Easton picks up on the growth of the white British population along the Essex coast in places like Leigh on Sea. The suggestion is that the cockney sparrows who were rehoused in the postwar homes for heroes of the Becontree estate in Barking and Dagenham, and who invested in the Thatcherite “rght to buy” dream, have now cashed in their equity and their Ford redundancy cheques to move further out. He misses one salient fact. The white British population has seen its biggest percentage increase of 13.7% in South Derbyshire, where Toyota has its Burnaston plant. The first car rolled off the line there in 1992 and even in today’s economic climate there are vacancies for production workers. Quite a draw for ex-Ford workers, I suspect. By comparison with inner London boroughs, where the “white other” category of rich white Europeans and Russians is growing, the story in Barking And Dagenham is different. “The people moving into the borough tend to be of black African heritage. I was introduced to Victor and Victoria, whose parents came to Britain from Ghana in the 50s. He works for London Transport and she is a nurse in the NHS – typical of the professional black families who’ve arrived from inner London to take advantage of available housing as the borough’s white residents leave. Easton’s piece triggered 2,062 comments, many of those most highly rated vehemently hostile to his argument and to immigration and minority ethnic communities, while pleas for tolerance and stories of the geographic mobility of previous immigrants to London, including the Irish, are lowest rated. Then there are the writers who should know better. Step forward Graeme Archer at the Daily Telegraph and a piece entitled Let’s talk about the exodus of 600,000 whites from London. As if we were not. He takes the Glasgow comparison and paints a dystopian vision. His vision of a collapsing society is not one I recognise from South Woodford. Not for nothing does his Telegraph biog state that “Graeme Archer is a professional statistician, who won the Orwell Prize for Political Blogging in 2011”. So we have the bow to impartiality before he draws the opposite conclusion to Easton. And then there are the BBC’s alleged sins of omission in reporting on Bethnal Green. Except that a cursory Google search finds the BBC has been covering the attacks on gays since at least 2011. Archer’s piece is sufficient to generate another 1297 comments and counting for the all-important click count, most written by people angry at the fact of immigration and attaching the blame to Labour politicians for the alleged adverse impact. There are in the comment threads on both stories a smattering of expats and people planning to leave the country, oblivious to the irony that they will rely on the welcome other countries extend to immigrants. In the Guardian, Rupa Huq points out a delicious irony. London’s soul, she says in an echo of an old punk song, is in the suburbs. Not only that, but most immigration is now temporary. Instead of the “Ellis island model” of settling for good, 72% will now leave within five years, according Migration Observatory at the University of Oxford. The fact is, then, that many of the Telegraph-reading whingeing Poms who’ve taken off for foreign climes will be back to “dear old Blighty”. Just when you thought you’d seen the back of them. This entry was posted in Politics and tagged Census, Home affairs, London, Migration, Motor industry, Population, Race, Statistics on February 25, 2013 by paulnettleton.